Q: I am a new AMGBA member and I have a tech question. 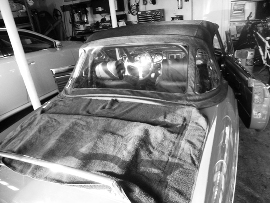 I have a 1977 MGB with twin HIF carbs and pertronix ignition. My question deals with timing. When I got the car (my 4th MGB) the vacuum was not hooked-up . I was advised to hook it up. When checking the timing with a light I found it to be 10 degrees BTDC @ idle with approx 30 degrees @ 1500 RPM. I reset it to 13 degrees idle. My issue is when I hook the vacuum advance, the timing will advance to about 45 degrees idle and even more @ 1500 RPM. Back in the day when I had cars with a vacuum advance, I set the timing and hooked up the vacuum and did not look to see what happened. I looked at the B to insure the advance worked and it did. Is this normal or should I not use the vacuum. The car runs fine without it but if it works better with it I would use it. What do you think? Thanks. A: Your car has been modified, so the manual does not exactly apply. I am not sure, but there may be some things that you are doing that can effect the timing. First, when you disconnect the vacuum tube, it should be from the distributor side and you should plug it before attempting to set the timing. The car should be warmed-up and at idle (800-950rpm). Being that your car has a twin HIF4 and you are saying it has a Pertronix conversion, you should have either a 25D or 45D4 distributor, not the stock electronic unit. I can make some suggestions based on that. To begin with, the vacuum advance would be necessary with this set-up. And failures of the advance systems, mechanical and vacuum, are fairly common on the 25D4 and 45D4 distributor. From what you are saying, the timing advances too far as soon as you connect the tube, even at idle. It sounds like the vacuum advance is working, but the rapid advance at high idle may show something in the mechanical system. Weak or broken springs will cause the mechanical system to advance too quickly, but don’t jump to trying to find replacements for those before looking at the more method related possibilities. For one thing, the mark for this set-up should be about 8 degrees BTDC at idle. This is more typical of the older set-up. I have a 73 with twin HIFs and a 25D4 that this works well with it. I also connect the vacuum line to the intake manifold, not the carbs. The photo below sourced from the web shows the stock position and the alternative pick-up. I’ve always had it hooked up to the manifold since removing the AIR smog system the car years ago. May not make too much difference, but I know it works. These are no cost changes, so I’d suggest you start there and see what happens. Let me know how you make out and we can take it from there. 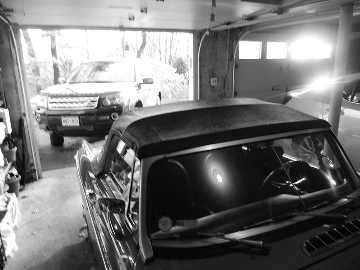 Q: I am installing a new Robbins top on my ’77 MGB. There are no instructions included. How is the loose material hanging at the rear window attached to the moveable frame bar? Any other tips will be much appreciated. Safety Fast! 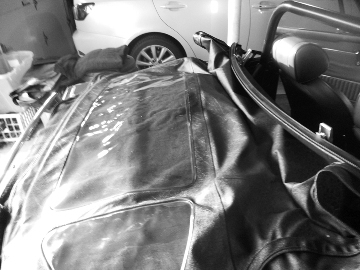 A: A trick taught me on changing my ’73 top was to leave that rear bar loose and not attach it to the top. It leaves some slack in putting the top up, making it easier (after it’s up, you then move the bar into place and it tensions the top nicely). And gives the same in taking it down. It also reduces creases and allows you to fold the top own that reduces damage to the plastic back windows and top itself. It involves pulling the top back flat on the boot and using 3 beach towels in stowing it. Takes a few minutes extra, but my AMCO vinyl top (considerably cheaper than a Robbins) is almost 20 years old and the windows are clear and unscratched and it is only now starting to show some wear at the attachment points at the rear. Using Velcro also gives you the option on how to handle that bar. 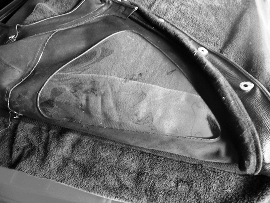 The way I do it is to put a towel on the boot, lay-out the top flat onto the boot, lay a second towel on top of the center window, fold the side-panel windows at the cloth divider (between them and the center pane) and one more for good measure on top of the folded windows. I fold the ends of the towels such to keep them from falling off in handling and further protect the plastic windows. This covers all the clear plastic, ensures none are creased and protects them from the frame. The last part (partially done simultaneous with all the above) is to bring the frame back and down, draping the opaque part of the top partially into the well below the frame and just the window portion, now cushioned in towels, draped over the front top bar. The window section now hangs mainly behind the seats and is mostly hidden by the front of the boot cover or the front of the tonneau cover when put behind the seats once opened. The photos will make it clearer. Safety Fast!